For five months straight, I lived in a hotel without a kitchen. Everything I ate was cooked in a microwave. At first, I craved the meals that required a convection oven. But by the end, I found I could make almost anything in a microwave. My favorite concoction was Nutella mug cake — a sinful, gooey, moist chocolate cake cooked in my favorite coffee mug in just under two minutes. But how does a microwave actually work? And what makes it so different from a convection oven? The microwave was invented, accidentally, by American engineer Dr. Percy LeBaron Spencer. When testing a magnetron, a vacuum tube that generates microwaves, he realized the candy bar in his pocket had melted. After seeing what happens when other foods (popcorn and eggs) were placed in front of the magnetron, he quickly realized that microwaves could cook foods rapidly. A microwave oven has three main parts: a magnetron (located on the side of the microwave) that makes microwaves, a waveguide (located within the wall of the microwave) that directs the microwaves from the magnetron to the food, and a compartment (where you place your food or beverage) to enclose both the food and the microwave radiation. Microwaves — just like radio waves, X-rays and visible light waves — are a kind of electromagnetic wave. But they have a unique property that makes them particularly useful for cooking food. All electromagnetic waves operate at different wavelengths. Microwaves are wedged right in between radio waves and infrared light. At this frequency, something interesting happens. Water molecules, which are made up of one oxygen atom and two hydrogen atoms, are, by nature, polar — the oxygen atom steals more of the negative electrons than the hydrogen atoms do, making the oxygen slightly more negative and the two hydrogen atoms slightly more positive. Food is full of these slightly polar water molecules. When left alone, they stay still. As a microwave travels, its electrical and magnetic fields change rapidly. When the wave travels near a water molecule, the molecule will try to align with the electrical field. Since the field is constantly changing, the water molecule rocks back and forth, generating energy in the form of heat. When the waveguide directs the microwaves, generated from the magnetron, into the compartment, all the water molecules are excited at once. This produces a lot of heat and cooks the food. Frequency is the key to this effect. If you pass radio waves or infrared light through food, the water molecules will remain still as if nothing happened. But microwaves are at just the right frequency to excite the water molecules and generate heat — something other forms of electromagnetic waves can’t do. In a traditional oven or stove, heat moves slowly from the outside in. But because microwaves travel straight through the food, exciting all the water molecules at once, a microwave oven cooks food evenly throughout. When heating food in a plastic or glass container, the microwaves pass straight through those containers with no interaction, making them microwave safe. But when heating food in a metal container, the metal will reflect the microwaves, causing sparks and sometimes a fire. So, experiment with your microwave. Go crazy. 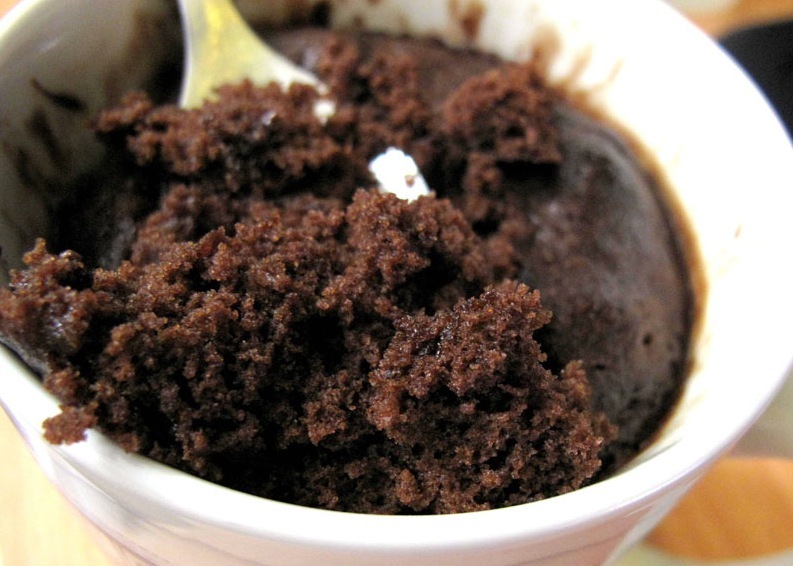 Make Nutella mug cake or your own version. But listen to Irving in American Hustle and never put metal in your science oven. Claire received her B.S. in neurobiology, physiology, and behavior from the University of California, Davis. Originally an animal science major with ambitions of becoming a veterinarian, she quickly learned she and large animals would never be friends. Instead, she spent her time in college studying science, writing for her school newspaper, The California Aggie, and working with military children in Japan, Germany, and Hawaii for Camp Adventure Youth Services. Don’t microwaves irradiate your food? Making microwaved food unhealthty? Not all plastics are safe in the microwave !!! Metal is unsafe in microwave not because it reflects microwaves. Microwaves induce an electric current in metals, and if the metal object has sharp corner, as in a fork or crumpled foil, the current can jump through air, causing sparks. Smooth metal does not cause problems in a microwave, but it’s better to be safe and not experiment. And to answer commenter Tracy, yes strictly speaking, microwaves irradiate your food, but only in the sense that all electromagnetic waves (including visible light) irradiate something. Microwaves are non-ionizing, that is they can’t break chemical bonds the way x-rays and gamma rays can. All they do is jiggle the molecules, heating them up, as described in the article. SuzanneLexington, KentuckyMy daughter just moved into a new aemntaprt and I wanted to get her a housewarming gift. The one thing she kept really hinting for was a microwave. So I found this GE Spacemaker and thought it would be just right for her aemntaprt kitchen. You know how aemntaprts are on space and this wouldn’t take up a lot of room at all. She was pretty excited when I presented it to her and tried it out immediately while I was still there.It works great for reheating things as well as cooking entire meals, as I found out when she made dinner for her father and me the other night. The food cooks completely and quickly. It allows her to do preparations on other things while one dish cooks so it’s also a real timesaver. Some of her friends have already asked her where she got her microwave so they can get one, too. I guess that’s a pretty good testimony as to what a good microwave this is.